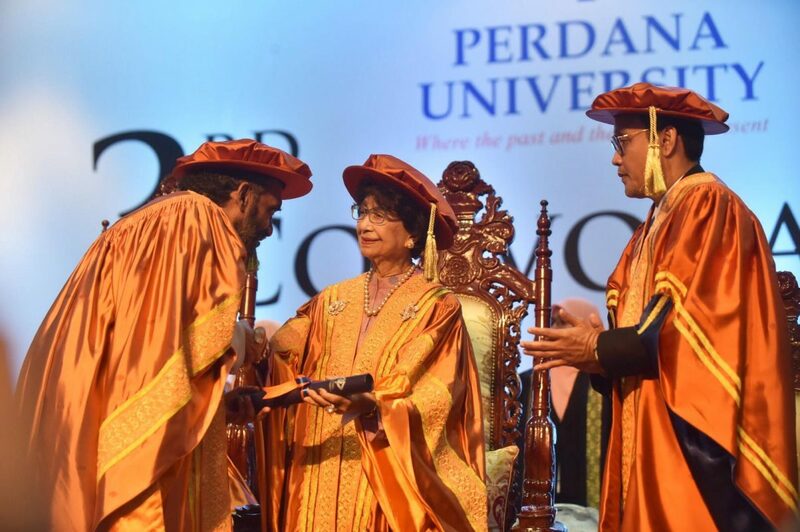 It is a historic year for Perdana University as it awarded two honorary doctorates to Tun Dr. Mahathir bin Mohamad and Tun Dr. Siti Hasmah Mohamad Ali at the 3rd Convocation Ceremony, held today in Serdang. 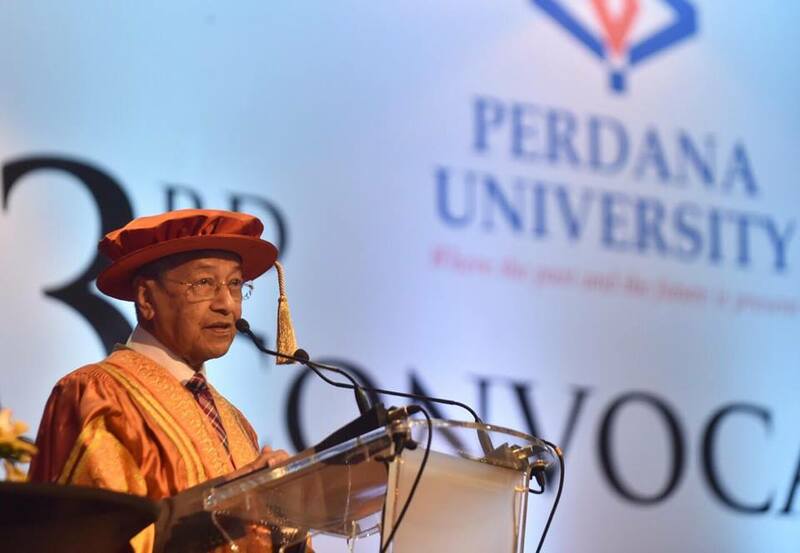 This is the first time that Perdana University is conferring the honorary degrees, which are the highest awards given by the University. 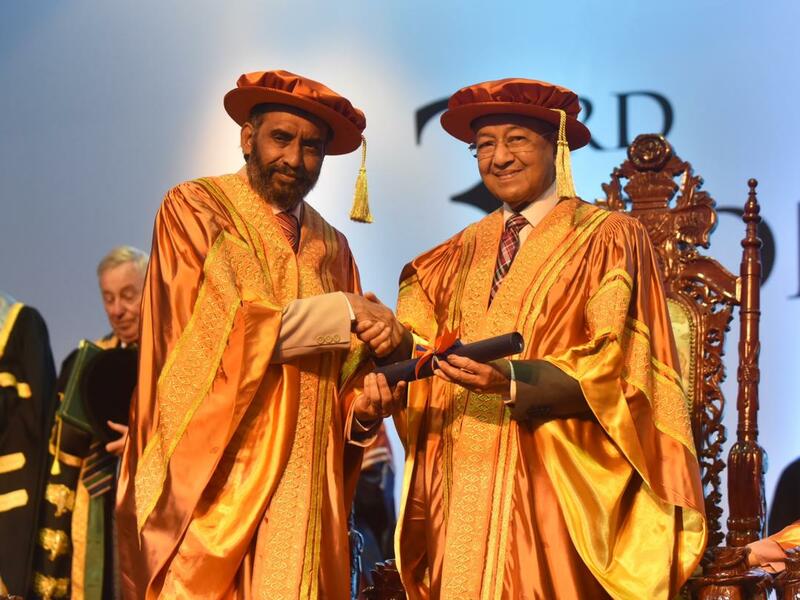 Tun Dr. Mahathir, who is also the founding Chancellor of the University, was awarded the Honorary Doctor of Philosophy Degree for Global Peace and National Reconciliation, while Tun Dr. Siti Hasmah Mohamad Ali was honoured with the Honorary Doctor of Philosophy Degree for Women and Community Development. This year, a total of 82 graduates received undergraduate and postgraduate degrees in Medicine, Occupational Therapy, and Bioinformatics. An additional 26 students received their Certificates in Foundation in Science. This convocation also marks the graduation of the first cohort of students from the Occupational Therapy degree programme. All of them have been offered employment within the local and international healthcare system. 28 special awards, recognizing graduates’ excellence in academic, research and service were also conferred. This includes two RCSI International Citizenship Awards, the first to be given to RCSI students outside of Dublin. Tun Dr. Mahathir Mohamad has worked tirelessly to advocate for diplomacy and nonviolent reconciliation throughout the region. He is a fearless critic of wealthier nations that have deployed military actions against less developed countries. As the President of the Perdana Global Peace Foundation, Tun Dr. Mahathir spearheaded the efforts to call for the illegalisation of all acts of war, including the conceptualisation, development, and manufacturing of weapons of mass destruction. In 2007, Tun Dr. Mahathir established the Kuala Lumpur War Crimes Commission and Tribunal to give voice to the victims of war in Iraq, Lebanon, and the Palestinian territories. He also launched the Mahathir Global Peace School to foster knowledge exchange and critical discourse on peace, thereby training the next generation of changemakers. Besides his work on the international front, Tun Dr. Mahathir has also been a national unifying force, galvanising Malaysians to stand in solidarity particularly in times of crises. Tun Dr. Siti Hasmah Mohamad Ali is an ardent champion of underprivileged communities, and is an expert scholar in women’s health. A true pioneer, she is one of the country’s first local medical doctors to serve Malaya just as the country gained independence. She then made history as the first woman to be appointed as the State Maternal and Child Health Officer of Kedah in 1974. In addition to the Honorary Doctorates, 28 special awards were conferred to selected graduates and students across the University’s five Schools who demonstrated excellence in academics, research, or services. The graduate who showed outstanding achievements in all three aspects was recognised with the prestigious Chancellor’s Award. This year, after a rigorous selection process, the University Senate chose Lee Voon Kaen to receive the Chancellor’s Award. Lee Voon Kaen graduated from the Perdana University – Royal College of Surgeons in Ireland School of Medicine (PU-RCSI) with the degrees of Bachelor of Medicine, Bachelor of Surgery, and Bachelor of the Arts of Obstetrics (MB BCh BAO). In addition to his academic performance, Voon Kaen was recognised for his contributions to the University and the community. Through his participation in the PU-RCSI Summer Research Programme, Voon Kaen had found his calling. He is the co-author of a study on Malaysian youths and alcoholism, and is now keen on pursuing a career as a clinical researcher. Voon Kaen is one of 63 graduates from the PU-RCSI School of Medicine, the largest graduating class yet. The International Citizenship Award was created in 2016 by the Royal College of Surgeons in Ireland to encourage medical students to be responsive to the diverse cultural and social challenges of their future profession. For the first time since it was established, RCSI is also honouring deserving students outside of the Dublin campus. The inaugural recipients are Rajwin Raja A/L Kanagarajah and Solomon Raj A/L Vasudayan. Both Rajwin and Solomon were actively involved in extracurricular activities and community service during their medical studies. Rajwin, who helped found the Perdana Editorial Network, was eager to extend his impact beyond the University. He is currently volunteering at an Autism Centre as well as with an NGO involved with empowering youths, while awaiting his housemanship placement. “In the multi-cultural environment that is the hallmark of RCSI, and which also characterises Malaysia, we have a heightened awareness of the importance of cultivating all students to be able to work well in an international setting. This initiative seeks to crystallise the asset that is a multi-cultural learning environment par excellence, and to overtly support students to become reflective learners enriched through that environment. With this initiative now extending to the Perdana University-RCSI School of Medicine, we are proud to highlight and optimise this experience during the undergraduate student years and I congratulate the first recipients of this award,” Professor McGee concluded. This year also marks the graduation of the first cohort from Perdana University Occupational Therapy programme. Established in 2014, the programme’s curriculum is designed to ensure graduates are industry-ready and includes 1,360 hours of clinical training. For the graduates who received their hard-earned degrees at the convocation, the extensive practical training proved worthwhile as all of them found employment soon after the conclusion of their studies. The Vice Chancellor’s Award recognises excellence in academic performance.